Last blog post of the year! 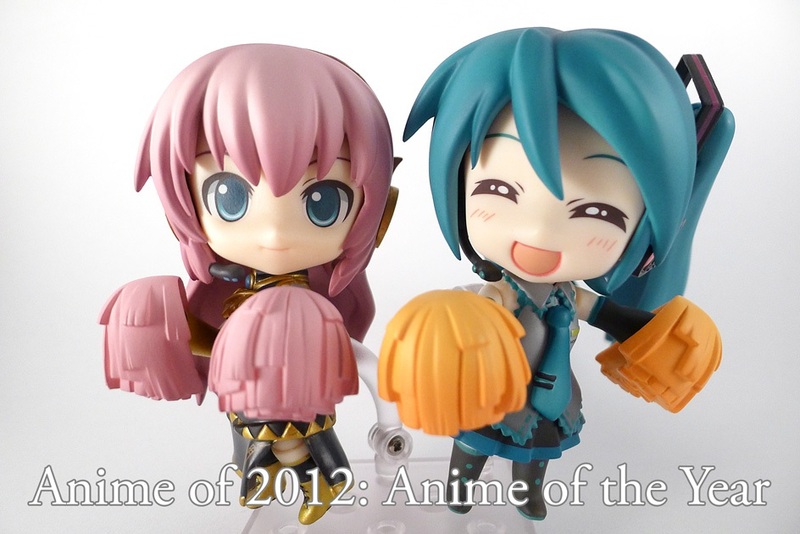 Here's a list of some of my favourite anime in 2012 along with a 一口レビュー (hitokuchi/bite-sized reviews) for each of them. Hotly anticipated and it did not disappoint!... Well. At least in the animation department. 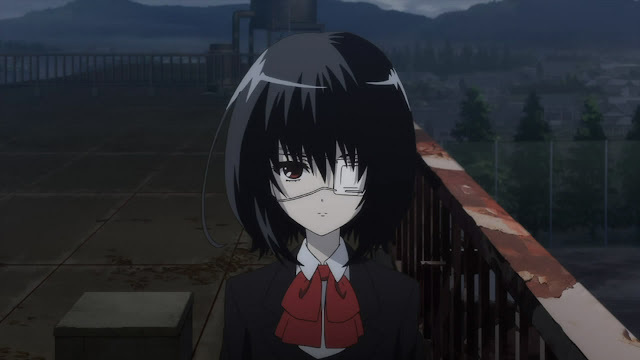 The conclusions to each arc were not very strong, but I think that mostly stems from problems with the source material. You see, this story was never meant to be published. The author, Nisioisin, has said that he wrote this for fun and his publisher advised him to publish it. While the plot is not very strong, it's obvious that he had a fun time writing all those fanservice scenes. Oh that toothbrush scene... that scene is a legend now. Ignoring those problems, Nisemonogatari is simply a huge visual feast. It's amazingly good looking and well animated. 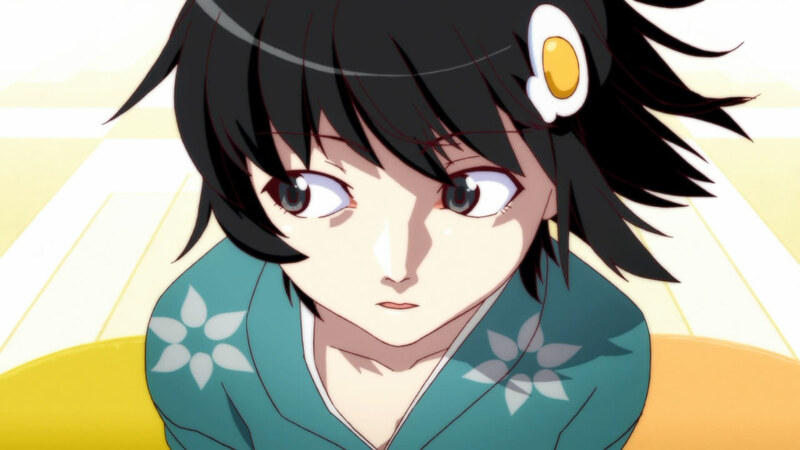 The art style from Bakemonogatari is back but spruced up with a larger budget. And sometimes, that's all it takes for it to go into my list of favourites. I honestly did not expect much out of this at first as I had taken a peek at the first chapter of the manga and did not see anything amazing. But holy crap do they know how to style it up! The director and studio doing this seemed to be aping a more subdued Shaft style so I checked and found out that the director did indeed work on a number of Shaft productions. Influences aside, I felt that many of the moments in this show was well-built up and very nicely framed, such as Rea's first night out and the flashback with the mum. However, I do have to point out that episode 8 felt absolutely awful to me. The drawings of the father and the pacing of the episode just felt off. The series is also guilty of spending way too much time in flashback mode and ultimately ending on a cliff-hanger. Season 2 please? 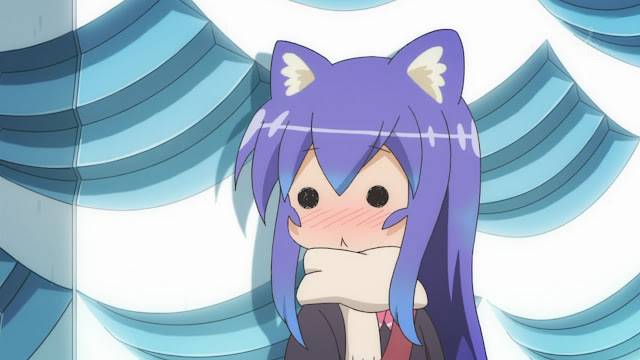 My love for Acchi Kocchi is well-documented on this blog. Despite the failed jokes and dropping the ball on the potential to realise one relationship, I love Acchi Kocchi because I love Tsumiki and Io. Yes, no other couple in the show mattered. In fact, no other character in the show mattered. They were there just to create situations for the One True Pair. This show probably wouldn't win any awards, but for the amount of fun, laughter and joy it brought to my life, it deserves a spot on this list. Come for the moe, not the comedy. This season of Fate/Zero started off weak. Sure, the CG was amazing, but the fight went on way too long. That's just about my only complaint for the series though. Studio ufotable continues to astound me with their animation and style. All of it just screams movie-quality and it never backs down. The second half of the story developed the characters more and the story beats were much more interesting than the first season. As character motivations became clear, the looming conclusion became more or more intense, ending in a climactic scene where Kiritsugu finally uses his command seals on Saber. 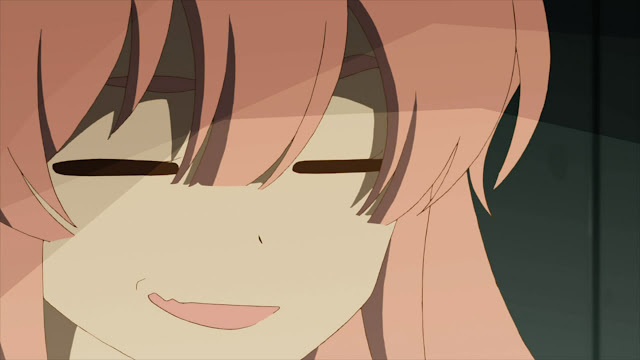 While Madoka's ending felt like a bit of a cop-out, Urobuchi Gen ties things up nicely in this one. Fan of the Fate series or not, you will love it. Being a fan of Watanabe Shinichiro and Kanno Yoko, expectations were understandably high for this one. The amazing trailer did nothing to lower my expectations, so I went in expecting a miracle. While the first few episodes were good, I soon realised this was going to be something different. 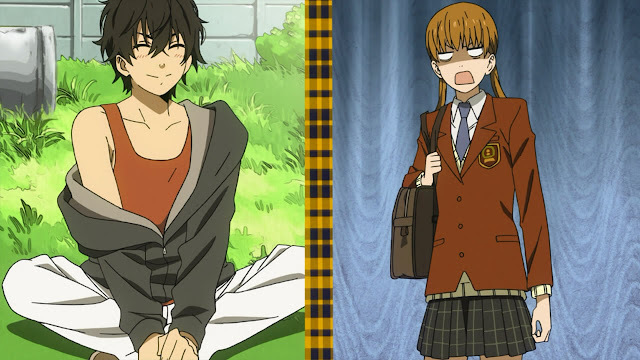 The story started to become awkward in spots, not knowing how the characters should interact with each other. 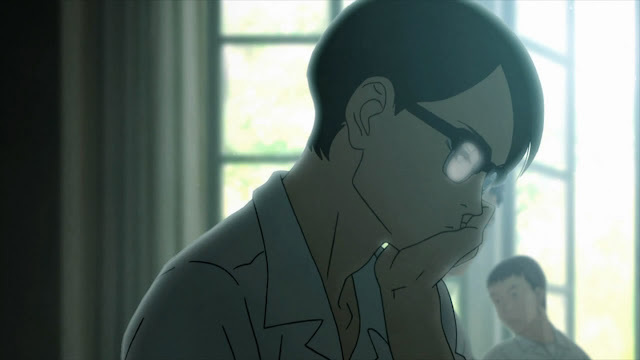 But overall, I applaud mature writing and the director's ability to slowly build up to that amazing medley in episode 7. It's the music that makes this show. Not so much the background music but the music that the characters actually play, because Jazz, in its free-flow nature, shows us another side of the characters and how they developed throughout the course of the series. In typical KyoAni style, some parts of the story just felt awkward or just lost in translation (from book to animation). I'll admit I'm not a big fan of KyoAni's sappier works, and even Haruhi has its bad days. 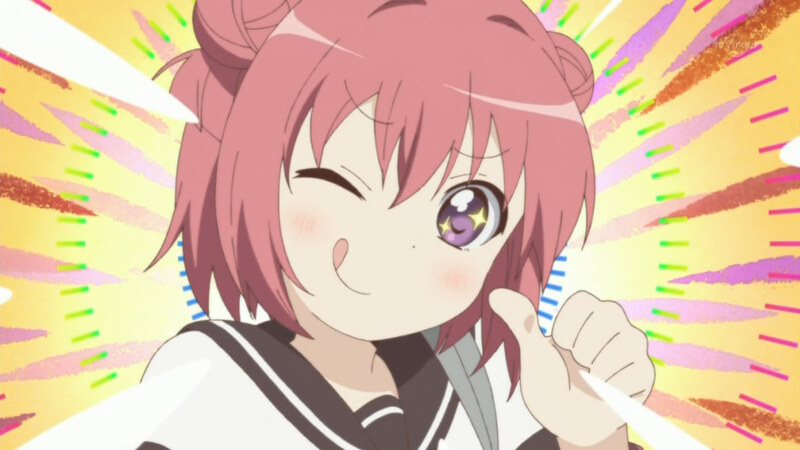 Don't get me started on Lucky Star and Nichijou. 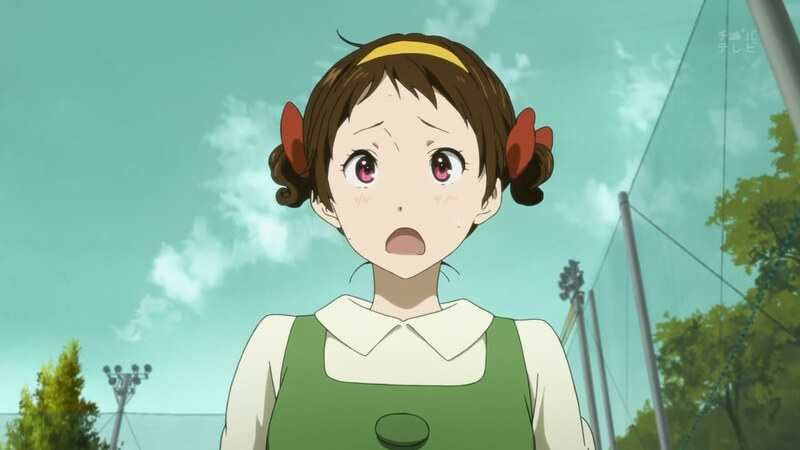 What Hyouka does different is that the visuals are a paradigm shift of quality. They have always had great animators, nearly perfecting character animation in the Haruhi and K-ON! films, but this brings that quality to TV and ups the details in the backgrounds, making it such a joy to watch. Appropriately so, since this is a 'mystery' series that goes slowly and allow you to soak in all the gorgeous details in every frame of animation, looking for hints in the background or a character's reaction. What a weird show. The premise seemed to have an endless well of creativity to draw from, but it soon dried up once you start to expect more. OK, so the middle episodes were not that bad, it just lost the level of madness it had at the start of the series. After a while, it seemed clear that the creators were moving to starting different though. 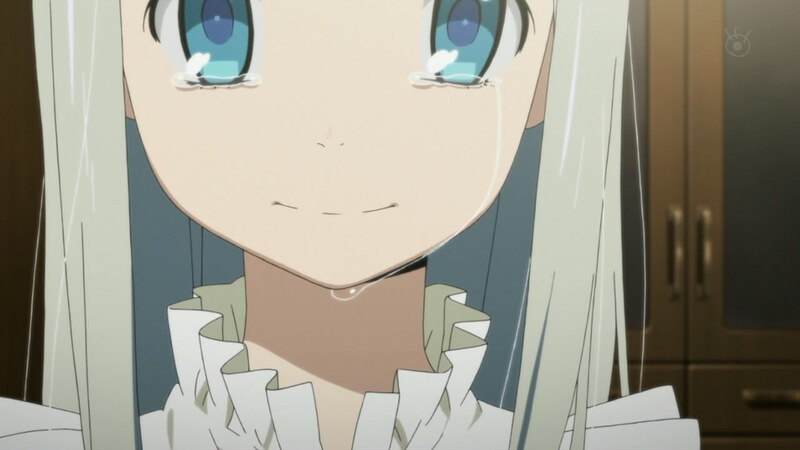 The last few episodes did a great job developing the nameless main character and helping us connect with her so that they could deliver a heart-warming ending. I have to concede they did pretty well there. Manipulating the audience and changing our expectations was a skill the production had and used to great effect. I was a late-comer to this series, but a friend (whom I can trust for all things moe) urged me to watch the first season before the second season starts, so I did, and loved it. What works well for this show is the wide range of humour and the comedic pacing with which it is all delivered. Each character brings something different to the table, but none of them are one dimensional (save for perhaps Akarin, but that was intentional). The relationship dynamics remind me of Ichigo Mashimaro, another favourite comedy of mine. Both have excellent boke characters that can carry nearly the whole show with just their tsukkomi counterpart. 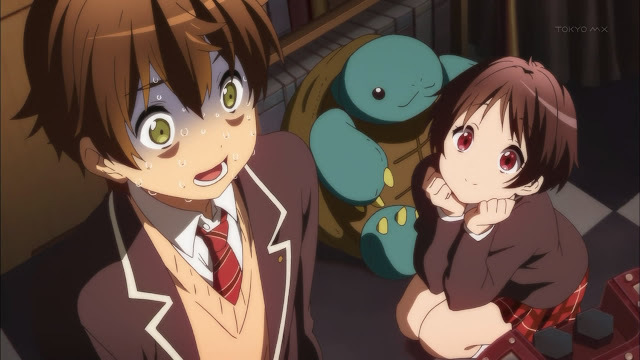 Also, I love Toshinou Kyouko's unique voice. 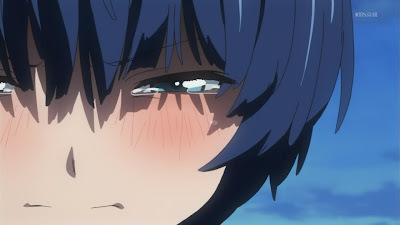 Why can't KyoAni make another action/mecha series? The simple answer is that it is easier to sell moe. The other answer that I got from watching Chuunibyou is that KyoAni would simply require too much money to bring the animation quality up to their standard. This show gives us a taste of what a KyoAni action scene would look like animated, but in the imaginary world of teenage delusions of grandeur. It is consistently interesting, funny, lovable, and emotional. 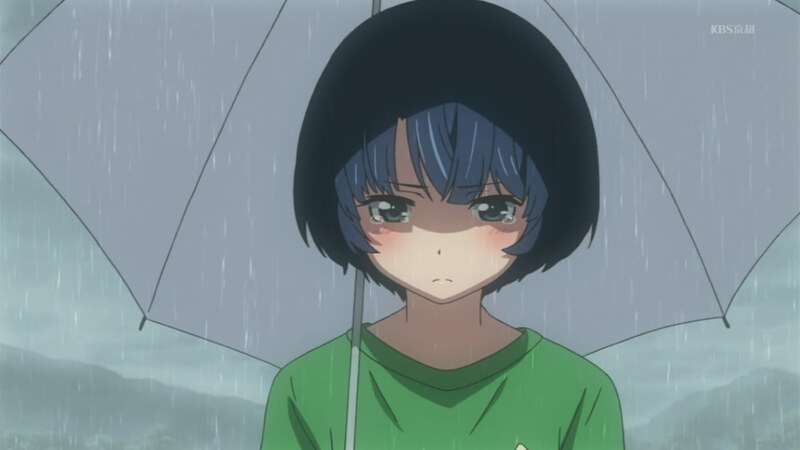 The kind of sappiness that KyoAni produces usually doesn't get to me, but my investment in the characters made the scene at Rikka's old house work. The confession on the other hand, was different from KyoAni's usual style, and hence really hit me hard. It was amazing. Emotional, cute, and beautiful all at the same time. The voice actors were also spot on as usual. I don't think any of KyoAni's works have had spotty voice acting, and this is no different. The only movie to make it on this year's list is, of course, from KyoAni. What can I say? The whole movie was in service of the fans, bringing back nearly every voiced character (big or small) and increasing the animation details on all their moe actions. 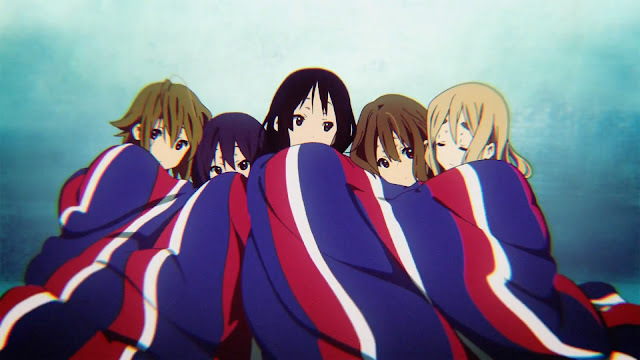 This also provides a better ending to the series so that fans will feel some closure and be satisfied with the fact that KyoAni will probably never revisit K-ON! again. Yeah, I don't think they will animate them after the manga split. With Haruhi and now K-ON! having wild success on the big screens, I hope KyoAni continues to make anime films. This is, after all, the best selling blu-ray anime film in Japan this year. Before I announce my number 1, let me just take a moment to take about some of the shows that will be entering their second cour next year. Shinsekai Yori is easily the one I'm most excited to sell the conclusion of next year. The dramatic tribal chorus music and the extremely well-written story not only amazes me with the size and scope of the world it created, but also the highly personal story of this small cast of main characters. This focus on a small group of characters shows the writer's constraint. As tempting as it is to go on and on to build your world, it is important to also write a story the readers can relate to. And the best way to do that is what they have done here with the narrator and character focus. Sources say it will end with 25 episodes, but I hope they are wrong and that there are more episodes planned. This series needs it. As with Tonari no Kaibutsu-kun, Sakurasou no Pet na Kanojo is show that I enjoy certain aspects of but hate substantial parts of it. 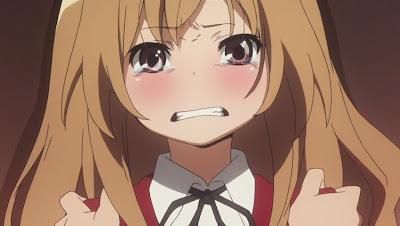 It feels clunky in the same way Toradora was before it found its footing and gut-punched the viewers with a barrage of emotional scenes. The same studio is behind this, and I do feel that they have their A-Team onboard, so I feel optimistic that by the time episode 24 rolls around, I'll be singing a more positive tune while possibly bawling my eyes out. The entirely original Psycho Pass has the potential to be another Urobuchi classic. Sure, he had some flops in the past before Madoka came around. But his current track record is impeccable. I've been enjoying the story so far and finally starting to see why he wrote certain characters in a certain way. 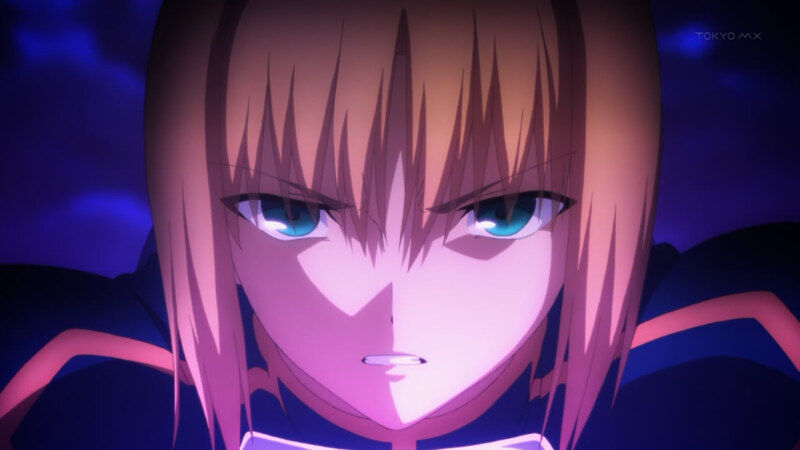 It remains to be seen if he can pull off an awesome ending, but judging from how he handled Fate/Zero, I don't think we should be too worried. Lastly, there's Robotics;Notes. Honestly speaking, I did not catch up with this series until recently. Now, the characters have grown on me and I can see hints of where the plot is heading. I still don't really know what to expect though, but I enjoy it enough to want to stick around to find out. So... on to the winner! Vic's Pick It was hard to pick between AnoNatsu, Fate/Zero, Hyouka, and Chuunibyou. I loved all of them and would recommend them to people depending on the type of shows they watch. They all have some flaws but are all really enjoyable and representative of the cream of the crop. 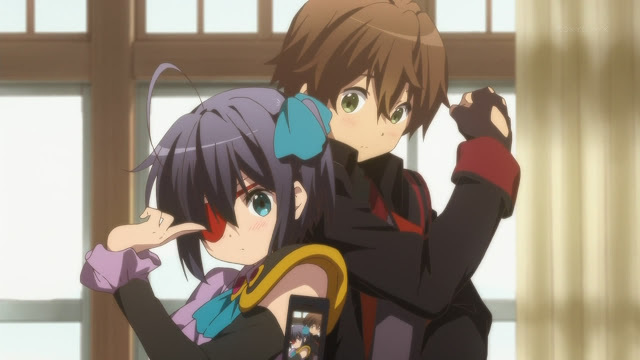 Ultimately, I would name Chuunibyou as my number 1 this year for being damn near perfect.